You can find part one of this series, which deals with Kickstarter, here, and the upcoming part three will go through the processes behind shipping and selling the game. Pros: Good quality & reputation. Reduced shipping times and costs. No language barrier. Pros: Significantly cheaper than Western based manufacturers whilst still getting most of the benefits of Western. Once you select a manufacturer - it will be a lot of work to switch so make sure you are happy with their prices before you decide. Ask for quotes covering multiple different volumes and various component types. Think of all the physical hoops your games will need to go through before they get to your players hands. Each of these steps will have costs and there will also be import and custom charges. Shipping is really expensive so give it the attention it deserves. There are multiple shipping companies you can contact for quotes and most manufacturers will also be able to arrange shipping for you. Check out this glossary of shipping and freight terminology as and when you need to double check what’s being discussed. Manufacturer’s worth working with will have an established catalogue of titles that you can peruse, and by doing so you’ll get a handle on what they have experience producing. 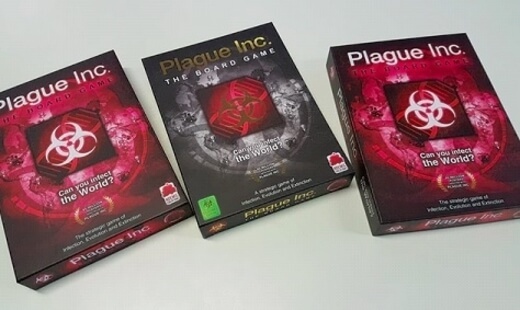 The manufacturer we went with produces a lot of retail successes such as Pandemic, Dead Of Winter and Scythe. This gave me confidence in their reputation and ability to deliver. We did think about working with a Chinese factory who were just starting up in the board game space, but in the end we decided that the 20-30% cost savings were not worth the risk of failing to deliver a quality product on time. When problems occur - you need to feel confident that you can easily communicate with your account manager. If misunderstandings arise - it can cause weeks of delay and there is nothing more stressful than needing to talk to the factory about shipping deadlines - only for no one to answer your calls! Ask how quickly your contact aims to respond to your communications and make sure they notify you in advance if they are going away on holiday. You need to feel comfortable communicating with your manufacturer If you find it at all difficult to share an understanding in the early stages then seriously consider how much harder things will be when production actually gets under way. Following an extensive search, I decided to go with Panda. I was impressed by their responsiveness and experience of manufacturing numerous other Kickstarters (as mentioned above). I also felt they offered us the best of both worlds: the cost advantage from manufacturing in China combined with the quality reassurance of a western company with a good reputation, as well as fluent English speakers to minimise the chance of misunderstanding. You do pay a premium over the cheapest Chinese manufacturers but I felt this was absolutely worth it (and as you will see below - this decision absolutely paid off). We started giving rough ideas of volumes and getting quotes on costs early on, and we refined those quotes over time to make sure there were no big surprises. Even after you have selected a manufacturer - try to have at least one backup supplier who also gives you quotes in case anything happens to your main one. And consider how possible language barriers might impact this. I found it very useful to break up more complex feedback or instructions into chunks, and to illustrate absolutely everything with photographs, mock-up images and examples. You might find it useful to ask for clarification that you have been understood correctly, as innocent communication mistakes are easy to make and costly, both in time and money, to put right. Until you have something in your hand - you can never really be sure what it will be like. Make sure that you leave enough time to go backwards and forwards with the factory multiple times (each round takes 2-3 weeks). I found it extremely useful to use existing manufactured games as a reference (“we want the thickness of the card to be the same as the aliens in Cosmic Encounter”) as this provides a measurable baseline. The factory will understandably not provide you with infinite free samples - sometimes it is worth paying for more. 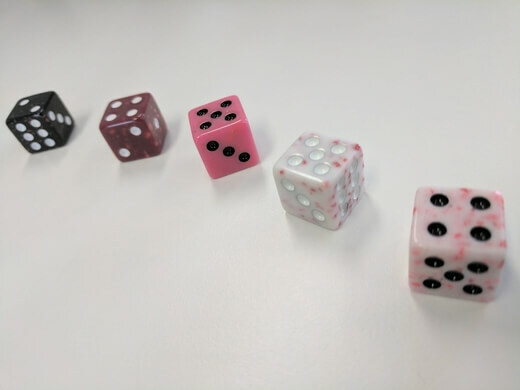 For example, with the Death Dice - we were struggling to find a design that would still be easy to read so I actually took the decision to pay for extra samples in the hope that one of the new ones would be better (and that is how we got our lovely blood-speckled die). 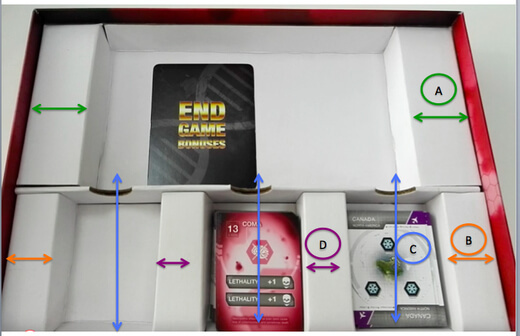 Think about how your box will fit in cases, how the cases will stack on pallets and how the game itself will be sent to customers. When you’re having cards cut out to size, there is a slight margin of error in the cutting process (called a ‘bleed’). Make sure you don’t put anything too close to the edges (we had to redesign a few things late in the day to make sure it didn’t risk getting cut off! No one knows or cares about your product as much as you so make sure you examine everything in minute detail - every time (just because it was ok last time, doesn’t mean it will be this time! 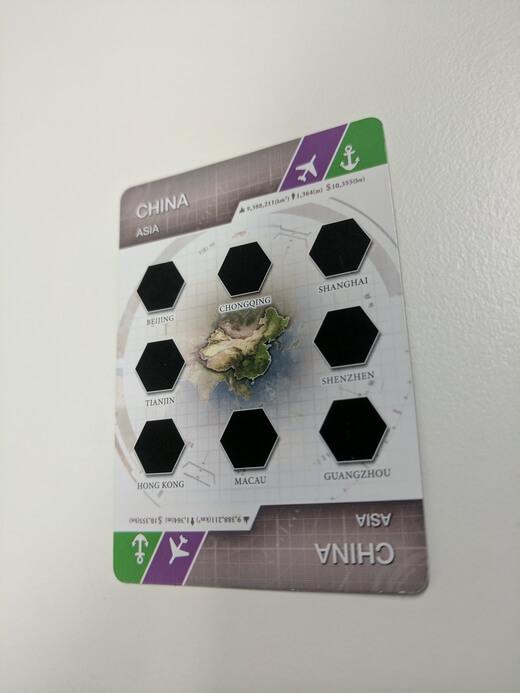 An example: a few weeks before we went to print we noticed that some of the Event cards were coming out a slightly different colour to the rest. They were identical in our files, looked identical on the digital proofs and it hadn’t been a problem previously. Eventually, after much head scratching, we realised it was linked to a specific computer merging the files into the PDF. We still don’t know why, but we redid it on a different computer and it all worked fine! We also had a number of quality issues with the plastics. 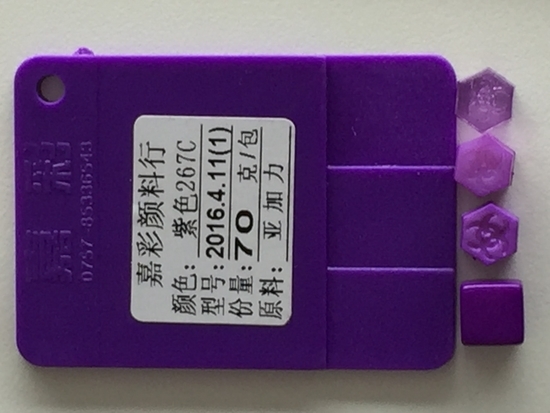 The supposedly final samples we got were extremely disappointing - rough edges, colour leakage, random bits of plastic sticking out. They were unacceptable and this put significant pressure on our timelines as the factory had to produce more and ship them over to us for approval. 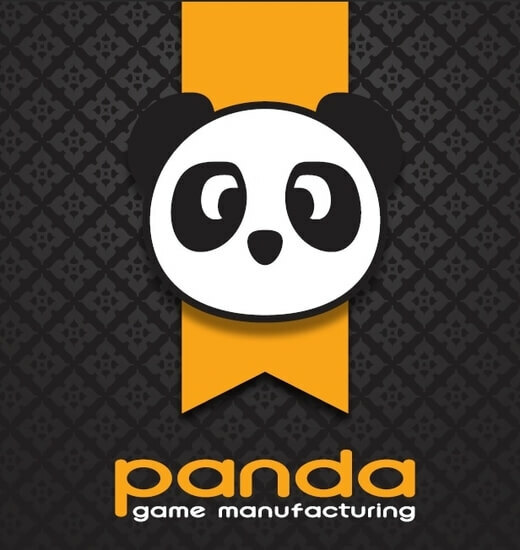 Panda were wonderful, though, as they recognised that the plastic quality was an issue they needed to own and they rearranged their manufacturing process entirely to make sure it fulfilled our needs. In the end they split the plastic order into two different batches, one to fulfil our Kickstarter orders and the other to hit our retail deadlines. By doing this Panda saved the day and made sure we could get games to our backers with minimal delays. Especially when deadlines are running tight - having a weekly (or even daily) call with your account manager can help you identify issues ahead of time, or even avoid them entirely. It lets you realise straight away if you are holding up the process and also makes sure that your project stays at the top of the manufacturer’s mind. (important when they are working to produce multiple games at the same time). If you’re manufacturing in China: be aware of local holidays! During our production run some smaller issues led to a few slight delays, but then the knock-on effect was that we were unable to have everything ready to roll before Chinese New Year. This meant a further week-long delay to the whole process at a critical time and it was a week I hadn’t even thought about losing until it was gone! Here’s a great resource to check important Chinese holiday dates for the next few years. There will always be problems and issues to resolve. You can save yourself and your backers a lot of stress if you build this into the timeline. We had X months contingency (which I thought was excessive) but in the end we used all of it and only just managed to ship to backers on time. Working with an experienced partner like Panda can also really help here as they are able to pull out all the stops to get your game to backers by the agreed date. As we were going through the process of manufacturing the game - various things popped up which we wanted to adjust / change in the future (e.g. a slightly different shaped box insert to hold the cards better). Keep track of these things as you go to make your life easier in the future. And that’s everything I have to share on the manufacturing process. I hope some budding designers out there find it useful! 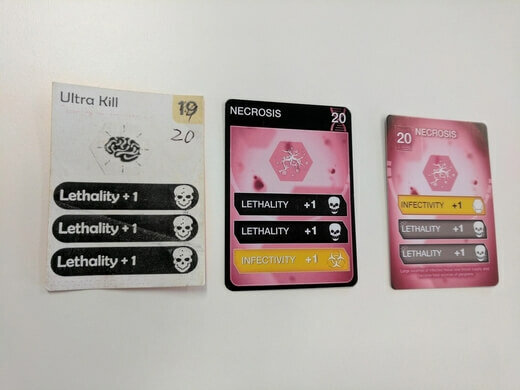 I’ve got one more ‘vivisection’ post in me to share - all about the scary process of shipping and selling your board game - and should have this up soon. In the meantime, stay healthy! Every project is different and has its own unique advantages and challenges. Read this post at your own risk and apply a lot of scepticism when considering how things might play out for your own projects! For example, one area in which I was very lucky was discoverability, as Plague Inc. is already a well known brand. 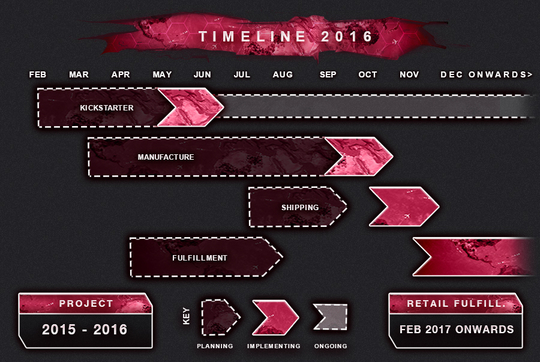 A very brief overview of the timescale of the project as a whole. Plague Inc. Mutation 16 Preview - The Royal Update is here!